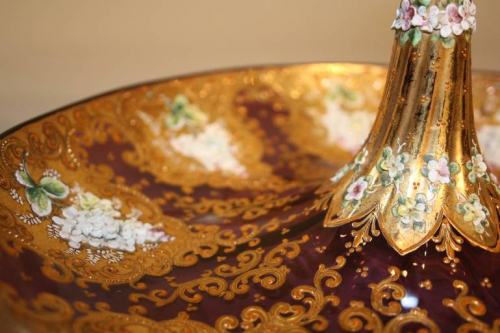 Exquisite enamel and gold decorated burgundy glass bon bon dish with details of flowers and leaves against gold sections. A really fine example of 19thC Venetian craftmanship. Excellent overall condition with no chips or breaks to the glass. The enamel and gilding is also in very good original condition with little or no wear.